A 79-year-old man with a prior history of distal gastrectomy and Roux-en-Y anastomosis for gastric cancer 2 years ago was admitted to our department. Contrast-enhanced computed tomography revealed an ill-defined hypovascular lesion in the head of pancreas without upstream pancreatic duct dilation [Figure 1]. Endoscopic ultrasonography (EUS)-guided fine-needle aspiration (EUS-FNA) was attempted using a forward-oblique viewing curved linear echoendoscope (EG-580UT, Fujifilm Corp., Tokyo, Japan). Since the head of pancreas was not visualized on EUS from the remnant stomach, the echoendoscope was advanced to the jejunojejunal anastomosis using the assistance of the endoscopic view [Figure 2]. Although intubation into the afferent limb was difficult due to the sharp angulation, a 2-cm, ill-defined hypoechoic mass in the head of pancreas was visualized on EUS from the proximal jejunum before the anastomosis and EUS-FNA using a 22-gauge needle (EZ Shot 3 Plus, Olympus Corp., Tokyo, Japan) was successfully performed without complications [Figure 3]. Histological assessment of EUS-FNA specimen revealed adenocarcinoma similar to the surgical specimen of prior gastric cancer, which confirmed recurrent gastric cancer metastatic to the pancreas. 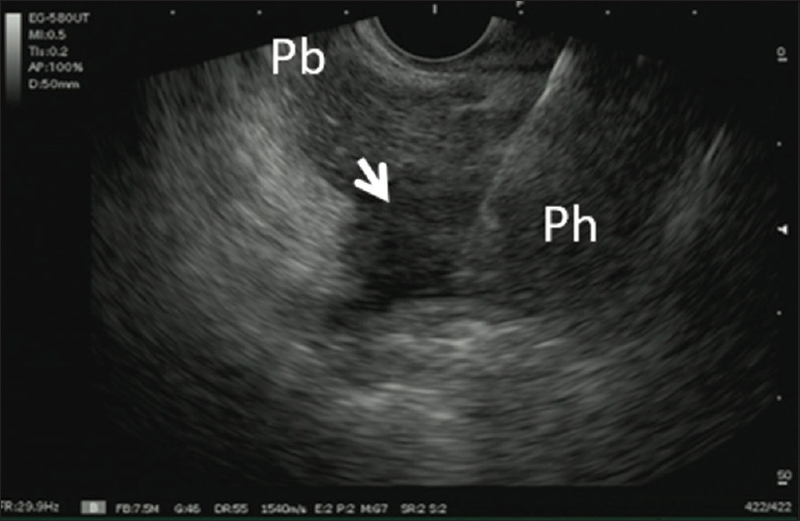 Although feasibility of EUS and EUS-FNA was reported in cases with surgically altered anatomy, the head of pancreas and common bile duct in cases with Roux-en-Y anatomy are difficult to access on EUS due to the difficulty in scope insertion into the duodenum through the afferent limb., This is the first case report of EUS-FNA of the head of pancreas using a new forward-oblique echoendoscope in a patient with Roux-en-Y anatomy. This new forward-oblique viewing echoendoscope has advantages of forward endoscopic view and 150° EUS image. In addition, this echoendoscope has wider bending capacity up to 150°. 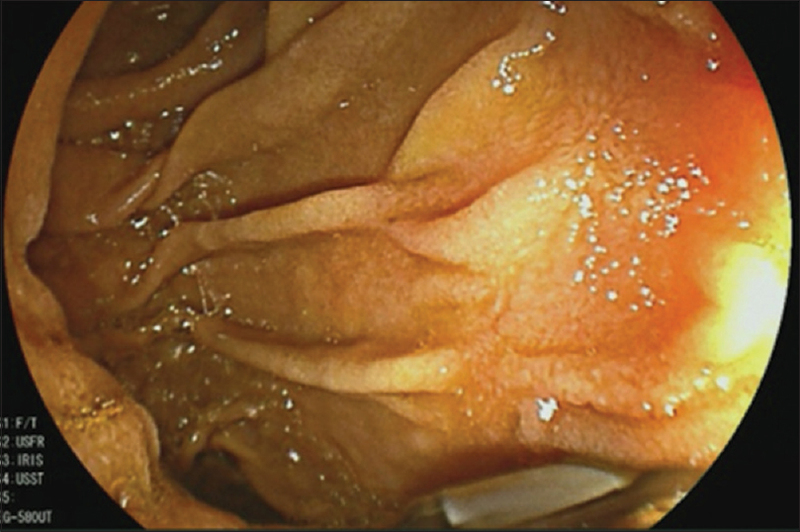 Those features helped scope insertion deep into the jejunum, EUS visualization, and EUS-FNA. In our case, intubation into the afferent limb was difficult even using this new echoendoscope. However, our case illustrated that EUS-FNA is sometimes possible from the jejunum, even if intubating the afferent limb is impossible. Author Y.N. and H.I. have conducted collaborative research with Fujifilm Corp. (Tokyo, Japan). Other authors have no COI to disclose. Wilson JA, Hoffman B, Hawes RH, et al. 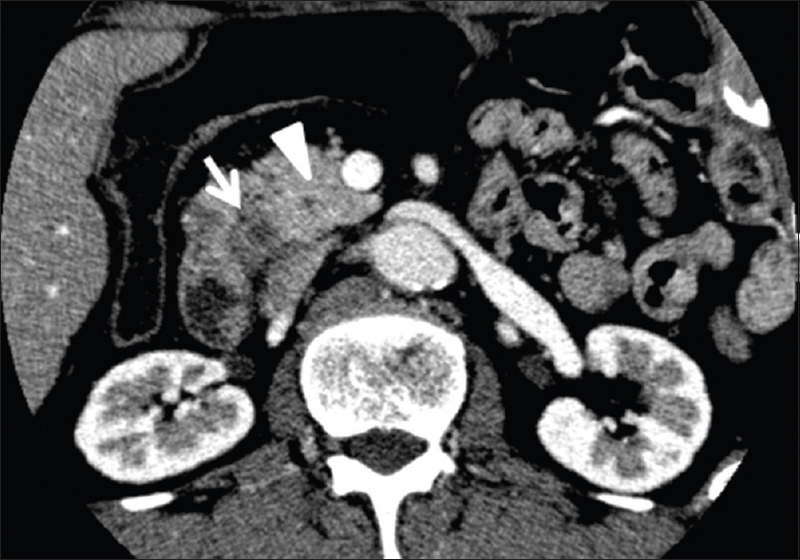 EUS in patients with surgically altered upper GI anatomy. Gastrointest Endosc 2010;72:947-53. Itoi T, Itokawa F, Sofuni A, et al. Endoscopic ultrasonography-guided fine needle aspiration biopsy in a patient with prior Billroth II gastrectomy. Dig Endosc 2011;23 Suppl 1:162-3. Kawakami H, Kubota Y. New curved linear echoendoscope for endoscopic ultrasonography-guided fine-needle aspiration in patients with Roux-en-Y reconstruction (with videos). Endosc Ultrasound 2017;[Epub ahead of print].